Did you know that in World War II American factories turned out a ship in four and a half days? American productivity in World War II was greater than all our enemies combined—two times greater. In fact, if the output of all all the warring countries in the world was added together, including the USSR, the total barely exceeded that of the U.S. by itself. American factories stopped making many consumer goods altogether. Car companies, for example, ceased making cars for civilians and made everything from trucks, airplane engines, and even torpedoes. The Lima, Ohio tank factory began churning out tanks like McDonald’s makes Happy Meals, finally refining the process until a tank could be produced from scratch in four and a half hours! America built some 310,000 airplanes in four years of war. But some of the most amazing feats involved ship construction. America built 17 fleet carriers, dozens of “baby flattops, and hundreds of ships (while Japan built only one more fleet carrier through the rest of the war). An immediate need was for merchant shipping in the form of “Liberty ships,” which were relatively simple vessels with navigation, propulsion, and lots of space for war materials. America’s leading builder of Liberty ships was businessman Henry Kaiser, who had built Grand Coulee Dam. He set up shipyards in California, and, lacking a workforce there—California’s population then was nothing near what it would be 30 years later—and to attract workers, Kaiser had to first build large-scale housing developments. His construction methods are widely copied today, which is referred to as “stick building” that used a modular method of making prefabricated sections. In the early stages of the war, it took about 160 days to build a Liberty ship, but after about six months Kaiser had the process down to under 40 days. Then he reorganized his construction processes to lower the construction time to a mere 28 days. But a competitor build a single Liberty ship in just 10 days in late 1942. Kaiser gave part of his workforce a day to rest up, then at the designated time, a whistle blew and thousands of ship workers ran in to work on the U.S.S. Robert E. Peary. Kaiser’s crews completed the vessel, and it slid into the water, service ready, in four and a half days. It was one of the most astonishing construction feats in history, perhaps only equaled by the repair job done on the U.S.S. Yorkdown, seriously damaged at the Battle of Coral Sea. Repair crews were flown to the Yorktown while it was still limping home, and completed a two-month repair job in just 48 hours, whereupon the Yorktown played a key role in the critical victory over the Japanese at the battle of Midway. 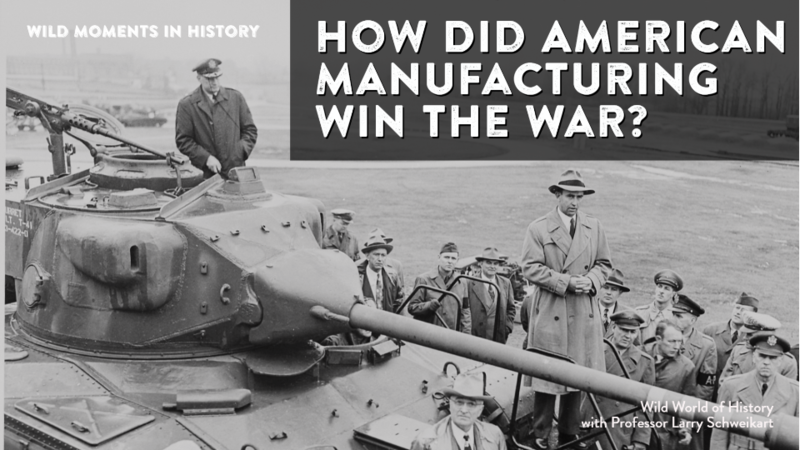 For more, see Larry Schweikart, America’s Victories: Why the U.S. Wins Wars.